Tax Justice Network: What could possibly go wrong for Ghana? 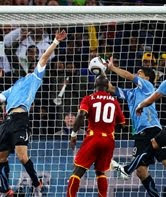 Following Ghana's recent World Cup defeat at the hands (literally) of Uruguay's Suárez, Khadija Sharife has just posted a blog in with the London Review of Books on how Ghanaian people are vulnerable to cheating on a far larger scale, albeit not so visible on television sets around the world. Ghana is entering into its era of oil and gas production. Before end-2010 the Jubilee oil field, one of Africa’s biggest offshore finds since the start of this century, could turn Ghana into the continent’s fifth largest oil-producing nation, bringing in upwards of $800 million a year. Happy days. But drill a little deeper, and you find the first signs of resource curse are readily discernible. As Sharife reports, ownership of the Kwame Nkrumah MV 21, the Floating Production Storage and Offloading facility used in the Ghanaian production programme, is obscured through offshore special purpose vehicles in the Netherlands, a country widely used as a conduit for shifting profits offshore. The scene is set for billions of oil and gas wealth to disappear offshore. The Barclays Offshore Banking Unit, the first of its kind in Ghana and indeed Africa south of the Sahara continues to offer world class banking service to non-resident private clients and corporates. Combine oil wealth and offshore banking, add a spoonful of state negligence (the Bank of Ghana has already stated the International Financial Services Centre in Accra "should operate with a minimum of regulation"), leave to simmer for a few years while G-20 countries prevaricate and bicker about strengthening judicial cooperation and removing obstacles to market transparency -- and what could possibly go wrong? Read Khadija's posting on the London Review of Books blog here.